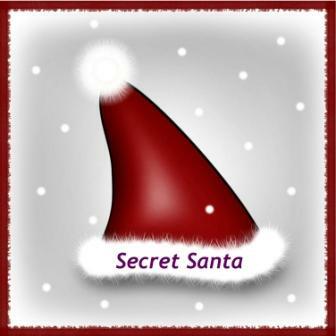 I want to thank each and every blogger who signed up for Secret Santa – even those I had to disappoint as they were the only bloggers in their country. I had a few bloggers pull out after the assignments were set and to this end I have to thank a friend for stepping in at the last minute to take part. Some bloggers who signed up failed to follow up – but, that is their loss. Here is the Secret Santa Round Up for 2011. The first blog post is from Blue Jellybeans from Spain. Having only two bloggers in Spain taking part, they were each other’s Secret Santa and you can read all about Chica Andaluza’s gift here. I was surprised as I did not put my name in the hat so to speak, but I did get a gift box, full of lovely goodies – take a look. Pretty Little Thing has showcased her gifts here. Sous Chef Secret Santa sent her some interesting products which you can see here. Mandy got a lovely bounty from Colleen. Teri, The Freshman Cook got an amazing gift from Bexx. Bexx’ Santa chose to stay secret, but you can see what she sent here. Usha received some treats and some seeds – take a look. I will continue to edit this post as I see more blogs surfacing. In the meantime I would like to wish each and everyone of my readers a blessed Christmas and / or Hannuka if you are celebrating. And whether you do or don’t celebrate, have a great December. We are on leave from work from the 15th of December until the 9th of January – and I am taking leave of blogland for that time as well. This is the time of the year I get to celebrate my wedding anniversary and do things that I don’t get to during the year, like write about our holiday we took in France this year April and May. I will also start work on my second recipe book and cook and bake up a storm. I will be back here with a post on the 28th however, so do come and take a look then. Happy Anniversary Tand. Have a fun holiday season and a good rest. Merry Christmas Tandy! I hope it’s a great one, also… I wanted to let you know that I’ve selected you for the Versatile Blogger Award. You can find out about why I selected you and what you need to do in my link below. Have a lovely Christmas Tandy – here’s to more foodie fabulousness in the New Year. What a wonderful idea. I am sure you put in a lot of work organizing the secret santa. Have a wonderful holiday! Have a healthy and happy holiday season and a great new year. You are such a dear to organize. I’m definitely in for next year when things have settled a bit. Good luck on the book Tandy. I love Secret Santa. It’s such a great idea and so much fun. Hi Tandy, thank you for all of your help and assistance, and wish you and yours a happy and safe festive season and all the very best for 2012. Looking forward to lots more interaction and inspiration during 2012. I just wanted to let you know that the Presto Pasta Nights #244 roundup is now posted. Thanks for joining in the fun this week. Waiting patiently on Secret Santa. Have an awesome break Tandy, it’s well deserved and look forward to catching up again in the New Year.